Every year I try to carve out some special travel time with my 3 (soon to be 4 ) adult children. I specifically choose places or experiences that one of them in particular will enjoy sharing with me. Usually, I am able to figure out a way to get each of them to join me solo but occasionally the trip is too enticing and more than one wants to tag along. When this happens, it’s my job to juggle the needs and desires of all. It is not always an easy feat but I have figured out some key ingredients to cook up the perfect vacation. Here are my three best tips to successful traveling with adult children. This sounds like advice for parents traveling with a toddler but believe me, it is even more essential when traveling with your adult kids. Recently, we headed to Hawaii, me, my son and my middle daughter. The first leg of the trip we stayed on the Hawaiian island of Maui; in the idyllic area of Wailea. This specific area is host to some of the islands most posh resorts and is the perfect spot to take in some peace and quiet. We chose the Wailea Beach Resort as it fit some important criteria for all of us. For my son, it was the close proximity to the water, beach and the easy access to paddleboards and snorkeling. I was in heaven with the gorgeous sunset balcony views, the morning outdoor yoga classes, and the tranquil and serene atmosphere. 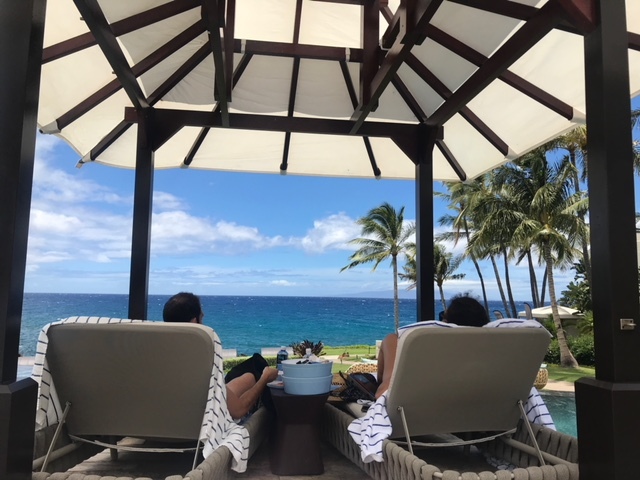 My daughter loved the upscale room amenities, the easy running paths and the fun we all had posing in the interactive Instagram-friendly ALOHA sign. We spent our days lounging around the adult-only infinity pool, aptly named the serenity pool on the property. We were all happy to stick close to the property most days, swimming, sunning and having some respite from our usual, overly booked and way too busy professional schedules. In Maui, we booked a sunset sail and an early snorkeling trip so we would all have the opportunity to get into the water and also take in the magical views of Hawaii offshore. I knew from experience that to make this trip a memorable success we needed a little more excitement, so the second half of our vacation was the bustling island of Oahu. We opted for an iconic location, the Moani Surfrider, better known as the “first lady of Waikiki”, as it was the first luxury hotel in the early 1900’s to be built right on the beach. Situated centrally on Waikiki Beach, this spot put us super close to some great shopping and dining but was still a convenient location for my son to easily grab a surfing lesson, and for us all to spend some time on the beach. This time on Oahu allowed us to get our foodie needs met with some great reservations within walking distance and to venture a little further afield when we decided to have breakfast with the local Hawaiians. It was all about finding the best Ramen and sushi in town and we were not disappointed. This last tip cannot be over emphasized. Just making sure that you always leave some time to do nothing other than being together. This is when the magic happens. Those unexpected conversations or spontaneous activity that has you all laughing and reminiscing for years. These unplanned moments are that ones that insure that when the next travel opportunity arises -everyone wants in! During our down time, we all decided to take in some last minute massages at the Moana Lani Spa. We are still talking about what a rejuvenating idea that was for all of us!